JUST ADDED 12-3! Morbark Heavy Duty Pull-Behind Wood Chipper (More Info Coming). JUST ADDED 12-3! 2000 Ford F-250 Extended Cab Pickup, VIN# 1FTNX20F0YEC03762, 7.3 Liter Power Stroke Diesel Engine, Automatic Transmission, 144,032 Miles, 2WD, Cloth Interior, Power Windows & Locks, Power Mirrors, Air Conditioning & Heat, AM/FM/Cassette, 265/75R16 Radial Tires, Pickup Box Topper, Cloth Interior. 1995 Freightliner Columbia 120 Conventional Truck Tractor, VIN 1FUY3ED8XSH446642, Cat 3176 Turbo Diesel Engine, 10 Speed Transmission, 48″ Flat Top Sleeper Walk In Sleeper, Full Faring, Cruise Control, Jake Brake, AM/FM CD Player, Air Conditioning, Cloth Bucket Seats, 488,382.3 Miles, Air Ride, Wheel Base 245″, Single Exhaust, 2 Aluminum Fuel tanks, 90 Gallon Tanks, Half Plastic Fenders, 275/80R22.5 Radial Tires, All Aluminum Rims, In very Good Condition. 1990 Freightliner Conventional 112 Semi Truck Tractor, VIN 1FUYDRYBOLP380107, Cat 3406 Turbo Diesel Engine, 10 Speed, 48″ Flat Top Walk In Sleeper, 2) 90 Gallon Aluminum Fuel Tanks, 670,315.0 Miles, AM/FM CD Player, Air Conditioning, Cruise Control, Cloth Bucket Seats, Single Exhaust, 1/4 Fenders, Air Ride, 285/75R24.5 Radial Tires, Steel Rims On Drivers, And Aluminum On Steering, Right Side fender Mirrors, Wheel Base 245″, Clean Truck. 1981 Ford LN7000 1-Axle Truck Tractor, VIN# 1FDWR7000BVJ06362, Caterpillar Turbo Diesel Engine, 5 & 2, Parking Brake, Heat, 55,564 Miles, PTO with Wet Kit, (2) Upright Exhausts, 285/75R24.5 Radial Tires, Aluminum Wheels (Outsides only). 1987 Ford Single Axle Digger Derrick Truck, VIN 1FDXK84NOHVA34723, Detroit 8.2 Liter Diesel Engine, 5 Speed Transmission, 19,056.5 miles, Muncie Power Take-Off, VEH HGT 11′-6″, Steel Truck Box with Wood Floor, 2 Tool Boxes, 4 Hydraulic Stabilizers, ( Heat No Air Conditioning), Pintle Hitch, Altec Hydraulic 60′ 2 Staged Extension Boom, Drilling Rig, Bucket Attachment, Upper And Lower Controls, 10.00X20 Radial Tires. 2002 IHC Model 4700 1-Axle Dump Truck, VIN #1HTSCABRX2H503947, DT 444E Turbo Diesel Engine, Allison Automatic Transmission, 113,665 Actual Miles, PTO, Air Brakes, Power Steering, AM/FM Radio, Air Ride Seat, Cruise Control, 26,000 lb. GVW, 10’ Steel Dump Body with Heavy Duty Hoist & Cab Protector, 11R22.5 Radial Tires, Polished Aluminum Wheels, (Newer Rear Tires). 1999 Ford F550 Single Axle Dump Truck, Gas Engine, New Jasper Engine, Automatic Transmission, Dually. 1992 Model M931A2 5-Ton 6×6 Conventional Day Cab Truck Tractor, National Stock Number-2320-01-230-0302, Cummins 6-Cylinder Turbo Diesel Engine, Allison Automatic Transmission, Heat, Air Brakes, Power Steering, 6×6, PTO with Inland Wet Kit, Fixed 5th Wheel, Spring Suspension, Like New 14:00R20 Super Single Radial Tires, 50-Gallon Steel Fuel Tank, (1) Upright Exhaust, Auto Inflate Tires, Rear Pintle Hitch with Rear Electric & Air Hookups, 5,260 Miles Showing, Hard Cab, Front Air Hookups, Flip Hood, Fuel System Completely Gone Through in 2017 – Runs & Drives Great! 1999 Ford Model F-350 XL 1-Ton Dually Box Truck, VIN #1FDWF36S9XEE31884, Automatic Transmission, 245,999 Miles, Air Conditioning & Heat, AM/FM Radio, 11,000 GVW, 12’ Cube Van Body with Over Cab Storage, Rear Rollup Door, 215/85R16 Radial Tires. 1999 Ford Model F-350 XL 1-Ton Dually Cube Van, VIN #1FDWF36S3XEE59714, V-10, Automatic Transmission, Air Conditioning & Heat, AM/FM Radio, 11,000 lb. GVW, 203,779 Miles, 215/85R16 Radial Tires, 12’ Cube Van Body with Rear Rollup Door & Over Cab Storage. 1999 Ford Model F-350 XL 1-Ton Dually Cube Van, VIN #1FDWF3654XEE60323, V-10, Automatic Transmission, AM/FM Radio, 11,000 lb. GVW, 221,808 Miles, 215/85R16 Radial Tires, 12’ Cube Van Body with Rollup Door & Over Cab Storage. 1997 Ford E-350 Single Axle Van Truck, 5.4 Liter V-8 Gas Engine, Automatic Transmission, 104,187 Miles, VIN# 1FDKE37LXVHC05924, 14′ Long Box, 7′ High Box, Newer Cooper 225 17R16 Radial Front Tires, Goodrich 225/75R16 Radial Rear Tires, Roll Up Rear Door, Folddown Rear Ramp. 2006 Ford 350 XLT 4X4 Super Duty Pickup, VIN 1FTWF31P56EC97509, 6.0 Liter Turbo Diesel Engine, Automatic Transmission, Power Windows, Power Locks, Power Steering, Cruise Control, AM/FM/CD Player, Air Conditioning & Heat, Cloth Bucket Seats, 205,555.0 Miles, Bed liner, 75-Gallon Fuel Tank With Pump, Tool Box, 275/70R18 Radial Tires. 2004 Ford F 350 XLT 4X4 Super Duty Pickup Truck, VIN 1FTSF31P74EC62966, 6.0 Liter Turbo Diesel Engine, Automatic Transmission, Power Windows, Power Locks, Power Steering, Cruise Control, AM/FM Pioneer Radio, Air Conditioning, Cloth Bucket Seats, 212,003.3 Miles, 265/75R16 Radial tires, Bed liner, Tool Box, Runs Good. 2007 Ford F 150 XL Pickup, LGT Conventional Cab, VIN 122X7KD07586, 4.2 Liter Gas Engine, Automatic transmission, 161,685.2 Miles, Cruise Control, AM/FM Radio, Cloth Bucket seats, 235/70R17 Tires, Tool Box, Truck Runs Good. 1993 Ford F150 XL Pickup with Topper, VIN 1FBDF15Y5FNA78856, 4.9 Liter Gas Engine, 5 Speed Manual Shift Transmission, AM/FM Radio, Air Conditioning & Heat, 96,247.6 Miles, Cloth Seats, Bumper Hitch, 235/75R15 Tires, Bed Liner. 2005 Ford F-150XL Extended Cab Pickup, VIN 1FTRX12W45NA10017, 4.6 Liter Gas Engine, Automatic Transmission, AM/FM Radio, Air Conditioning & Heat, Cruise Control, Vinyl Seats, 141,995 Miles, Weather Guard Tool Boxes, 245/75R17 Tires, Bed Liner. 1979 Ford F 350 1 Ton Dually Pickup, VIN F375PFE1982, 400 HP Motor, 4 Speed Manual Transmission, 54398.8 Miles, Bench Seats, AM Radio, Heat, 235/85R16 Radial Tires,. Flatbed Box, County Truck, Good Condition. 2008 Ford Crown Victoria 4-Door Sedan, VIN # 2FAHP71V78X159036, 4.6 Liter Gas Engine, Automatic Transmission, 185,195 Miles, AM/FM Radio, Air Conditioning & Heat, Power Seats, Power Windows, Power Locks, Cruise Control, Cloth Bucket Seats, 235/75R17 Tires, Car Is In Good Running Condition. 2001 Ford Windstar Mini Van, VIN 2FTZA54441BB21791, 3.8 Liter Gas Engine, Automatic Transmission, 57,510 Miles, AM/FM Radio Cassette, Air Conditioning & Heat, Power Steering, Power Windows, Power Locks, Cruise Control, Cloth Bucket Seats, No Rear Seat, 215/70R15 Tires. 1993 Buick LeSabre Limited (FWD) 4 Door Sedan, VIN #1G4HR53L1PH502969, Gas Engine, Automatic Transmission, Power Steering, Power Windows & Locks, Full Dash Instrument Panel, AM/FM/Cassette Radio, 104,000 Miles, Leather Seats, No Rust, A/C Converted to 134-A Coolant, 205/70R15 Tires. 1986 Dodge Caravan, 4-Door, All Power Options, 192,000 Miles, Good Condition for the Age & Miles. 1982 Load King 8X12 Belly Dump Trailer, Model 2030 VIN 122239, 18 Yard Capacity, Roll trap, New Rim, New Tires, New Brakes, Spring Loaded, 11R22.5 Radial Tires, Hydraulic Belly Dump. 1970 Garwood Tandem Axle Belly Dump Trailer, Hydraulic Single Adjustable Center Dump, Air Brakes, 11R22.5 Tires, 12 Yard Capacity, Spring Ride. 75% brakes. 2002 Fontaine 45’ Drop Deck Steel Trailer, 8’5” Wide, 35’ Main Deck, 10’ Upper Deck, Headache Rack, Air Ride Suspension, (5) Strap Winches, 22.5 Tires & Steel Wheels, VIN# 131V24520821513299. 2013 H & H 16′ Tandem Axle All Aluminum Enclosed Trailer, VIN# 533TC162XDC225417, 7,000lb. GVW, Cargo Rear Doors, Side Door, 205/75R15 Radial Tires (Excellent Condition). JUST ADDED 11-26! 2007 Interstate Aluminum Enclosed Car/Cargo Trailer, 8′.5″ x 24′, Rear Ramp Door with Torsion Spring, 36″ Side Door, Torsion axles, Interior Lighting & Vents, Custom 2 Tone Paint , Aluminum Wheels, 10,000 lb.GVW, 8″ I beams on Main Frame with 6″ C-channel Cross Members, 10,000 lb Bulldog Jack, (10) “D” Rings in Floor, E-track Full length on both Walls, Brand NEW 10-Ply Radial Trailer Grade Tires, Less than 7000 miles on it since new. S & S 14’ Aluminum Tandem Axle Enclosed Trailer, Rear Ramp Doors, Side Door, 225/75R15 Radial Tires, Polished Aluminum Wheels. 2014 H & H Tandem Axle Dump Trailer, VIN# 533DB1422EC229666, 14,000lb. GVW, 235/80R16 Radial Tires, 14′ Long, Cargo Doors, Roll-Over Net Tarp, Electric/Hydraulic Lift with Remote (Very Good Condition). 1997 Miller Tandem Axle Tilt Deck Trailer, 18′ Hydraulic Tilt Deck With 4′ Flat Top Deck, 8′ Wide, 825R15 Radial Tires (Like New), Tool Box, All New Wood On the Tilt Bed, Heavy Duty Frame, Good Condition. 2003 Big Tow 16’ Tandem Axle Flatbed Tag Trailer, VIN #4KNUB162031161016, 14,650 GVW, 16’ Wood Deck, 54” Folddown Ramps, 245/75R16 Radial Tires. 1982 JFW Tandem Axle 16′ Flatbed Trailer, VIN 0001J349223, 16’X8′ Flatbed Trailer, Tandem Axle, 4′ Beaver Tail, With Ramps, 235/80-16 Radial Tires, Tool Box, Electric Brakes, Steel Frame. (1) 11’x6’ Flatbed Trailer with Sides. Fastline 1-Axle Utility Lawn & Garden Trailer, 5’x8′, 54″ Rear Ramp, 12″ Side Rails (Very Good Condition). 1968 Massey Ferguson Tractor/ Backhoe, Model 205, SN SDA659101274, 3Cylinder Perkins Diesel Motor, 3 Speed Transmission, Power Steering, 14X9X24 Rears, 7.50X16 Fronts, Model 200 Heavy Duty Loader, Hydraulic Hoe Has Stabilizers, 5′ Stick, 21″ Bucket. Gradall Model 544D-10 Rough Terrain Forklift, SN# 0355418, Cummins Turbo Diesel Engine, Hydrostat Transmission, 744 Hours on Major Engine Overhaul, 10,000lb. Capacity, 44′ 4-Section Hydraulic Boom, (2) Cylinder Hydraulic Frame Leveler, 4WD & 4-Wheel Steer, (2) Front Hydraulic Outriggers, New Foam Filled 14.00-24 Tires, Hydraulic Carriage Rotator, Joystick Boom Control. 2008 Komatsu Model SK1026-5N Skidloader, SN# A80029, 2-Speed, 5,711 Hours, OROPS Cab, Auxiliary Hydraulics, 72″ Bucket. Bobcat 72″ Rock/Root Bucket with Dual Cylinder Hydraulic Grapple. Industries America Model SP09 9′ Skid Loader Mounted Snow Pusher Attachment, Wings, Very Good Condition. Stout Hydraulic Tree Grapple (New-Unused). Unused Stout 66-9 66″ Brush Grapple Attachment with Quick Attach. Unused Stout HD 72-8 72″ Brush Grapple Attachment with Quick Attach. Unused Stout XHD 84-6 84″ Brush Grapple with Quick Attach. Unused Stout Tree & Post Puller Attachment with Quick Attach. John Deere Model 620 Gas Tractor, SN# 6218205, One of the last 620’s Built, Narrow Front, 6.00×16 Front Tires, 14.9×38 Rear Tires, Dual Hydraulics, 3-Point Hitch, Good Condition. DMI Model 3200 3-Point NH3 Tool Bar, 11-Shank Raven Nh3 Super Cooler, Rear Hitch, (4) Gauge Wheels, Spring Loaded Front Openers, Dual Rear Closers, Hydraulic Wing Fold. B & B Technologies 500 Gallon Pull-Type Sprayer on Tandem Axle Trailer, Hydraulic Drive Pump, 44′ Hydraulic Lift Booms, 11L-15 Tires. John Deere Model MX7 3-Point Shredder, SN# W00MX7X002781, PTO Drive, 7′ Width, Dual Rear Gauge Wheels. John Deere Model 27 12′ Pull-Type Stalk Shredder, SN# Illegible, PTO Drive, Hydraulic Lift 4-Wheel Carrier, New Paint. John Deere 980 Field Cultivator, SN# N00980X002692, 22′ Width, Hydraulic Lift & Wing Fold, Walking Tandems, Black 3-Bar Rear Harrow. John Deere Model H1110 Tandem Axle Disc, SN# 026583B, Manual Fold Wings, Hydraulic Lift, 18′ Width. King Model DF2 3-Point Offset Plow Disc, SN# E34521, 24″ Blades, Heavy Duty Weight Bracket. John Deere Model AW Tandem Offset Disc. John Deere Model F-145H 5-Bottom Semi-Mount Plow, 4’x18″, Rolling Cutters, Steerable. J.I. Case 6’x16″ 6-Bottom Semi-Mount Plow, Rolling Cutters, Steerable & Hydraulic Lift. Brady 10′ 3-Point Chisel, Model 1000, SN# 2555. N-P-K Piester 3-Point Flat Storage Corn Auger, PTO Drive. John Deere Model 350 3-Point Sickle Bar Mower, SN# 610735E, PTO Belt Drive, 7′ Bar. John Deere #513 3-Point Shredder Mower. John Deere A-B #540 Mounted 2-Row Lister with Rotary Moleboards, Fertilizer & Seed Boxes, 70 Years Old & Looks like a new one. 6′ Dozer Blade Attachment for a Loader. (2) Antique Tumble Bug Dirt Movers. Ferguson SP-912 Rubber Tire Compactor, SN 4721, O-ROPS, 3Cylinder Detroit Motor, 3 Speed Transmission, Hydraulic Front Steering, Tire sweeps. Bomag BW-142-PD Articulated Double Drum Smooth Vibratory Roller, Deutz Diesel Engine, Hydrostat Transmission, Dual Drum Vibratory Rollers. Pull Type 48″X48″ Drum Roller, Teeth & Scraper are In Good Condition. Sullair Model 185 Portable Industrial Air Compressor, SN # (Illegible), John Deere 3-Cylinder Turbo Diesel Engine, 2,125 Hours, 1-Axle Trailer, 175/80R13 Radial Tires. Dump Truck Box, SN 3016457, 13’x48″ with 2′ Sloped Extensions, Vibratory Attachment under Box. Gutter Maker, Inc 5″ Gutter Machine, Steel Drums & Rollers. American Chariot 3-Wheel Electric Scooter, Dual Batteries. 3-Point Cement Mixer, PTO, Hydraulic Dump. Blue Bird Sod Cutter, (2) Husqvarna Weed Eaters, (5) Stihl Weed Eaters, (2) Gas Powered Backpack Sprayers, (10) Assorted Gas Cans. RolAir Portable Contractor-Style Wheelbarrow Air Compressor, Honda 5HP Gas Engine, Dual Air Tanks. Coleman Portable Generator, 8HP, 4,000 Watt. Universal Portable Trash Pump with Gas Engine, New in Box. Universal Cold Water Pressure Washer with Gas Engine, New in Box. Coleman Portable Cold-Water Pressure Washer on Cart, Briggs & Stratton Gas Engine, Hose & Spray Wand. (4) New Sections MTA Distributors 5′ Steel Scaffold Sections, Safety Rail, (12) Wheels, Adjustable Height Stands, (6) Aluminum Scaffold Planks (All New), Clips, Pins. Clean Burning CB3500 Waste Oil Burner, Model CB-525-S2, SN28379, Has 21110 Hours, 2 HP Electric Motor, Clean Unit. (4) New Magnum Gold 4000 PSI 12V Hot Water Pressure Washers. Various Building Material, Decking, Doors & Windows. Jack Nitz & Associates Welcome you to a Complimentary Holiday Sausage & Pancake Feed From 8:30 AM till Auction Time on Auction Day. NOTE: There are additions added daily. 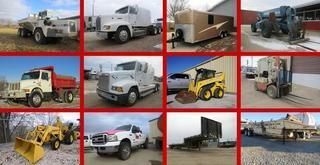 Check our website www.nitzauctions.com regularly for additional consignments. INSPECTION: Previous Inspection of the Equipment will be Tuesday, December 4, 2018 12:00 Noon-5:00 PM. 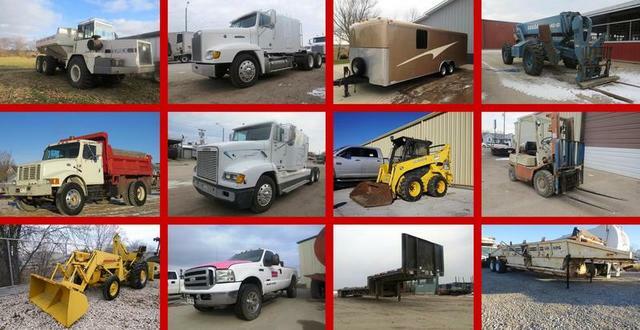 SCHEDULE: We will begin the Auction promptly at 10:00 A.M. with Top of the line Trucks and Trailers.